Really hard to get rid of this, but need the cash more than the wheels right now! I've ridden it for less than a year. It's blown me away at being so good at everything from steep technical climbs to crushing downhill. 2017 Trek Slash 9.8: Carbon frame Sram Guide R brakes, 200mm front rotor, 180 rear Sram X1 11 speed drivetrain Rockshox Lyric dual position air fork, 160-130 Rockshox Super Deluxe Shock, 3-position Maxxis Minion DHF 2.5 3C front/rear Will also include brand new Continental Der Kaiser Projekt 2.4 tire. Great as a rear tire. Upgrades include: Raceface SIXC 800mm handlebars DT Swiss XM1501 Spline One wheels (so good! Almost brand new, barely ridden) NSB 28-tooth front chain ring (for the steep climbs) Both fork and shock were recently professionally rebuilt and are running like new. Brakes recently bled and has new derailleur cables. There are some scuffs and dings typical for a bike that's been ridden in the mountains for almost a year, but it's in really good shape. Main issue is the front brake lever is bent from swinging down the back of a truck. As shown in photos. 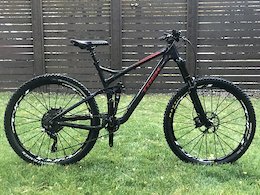 Selling my beloved 2015 Trek Remedy 9.8 with some nice upgrades. The bike is in good shape. It has paint chips on the down tube, rear triangle, and the handlebar, wear and tear from a season of riding. There is some transportation damage from a few rack rubbing incidents on the fork and rear triangle. See photos. Weighs 28lbs. Local pick up, or Buyer pays shipping. Frame: OCLV Mountain Carbon main frame & seatstay, alloy chainstay, Carbon Armor, ABP Convert, Full Floater, E2 tapered head tube, BB95, internal derailleur & dropper post routing, ISCG 05 mount, magnesium EVO link, Mino Link Fork: Rock Shox Pike RCT3 Dual Position 160-130mm Rear Shock: Fox Float CTD, DRCV HandleBar: Renthal Carbon Fatbar 760mm with Renthal stem (not as in photos) Brakes: Shimano XT 785, 180mm Ice Tech Rotors Cranks: Shimano XT 785 Chainring: Race Face narrow/wide 30t Cassette: Sunrace MX8 11-42 10spd and chain: KMC X10.93 Rear Derailleur: Shimano XT Shadow Plus SeatPost: Rock Shox Reverb Stealth 150mm Saddle: Bontrager Rhythm Pro Shifter: Shimano XT 785 Wheels: Mavic CrossMax Pro Tires: Maxxis DHF front and Bontrager SE4 rear Less than 1 hour riding after recent service: Full professional service on both shock and fork. New brake pads and lines bled. New cables/housings and derailuer tune. 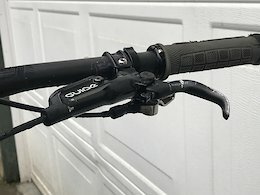 New lock-on Bontrager Grips Feel free to ask questions! 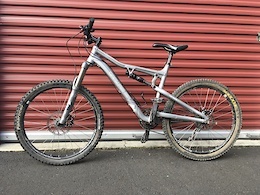 Selling my 2009 Gary Fisher Roscoe 2. It's been a great bike, fun to ride in all conditions and a perfect introductory bike for getting on any kind of trail. Roscoe 2 specs: Platinum Series 6066-butted aluminum, G2 geometry Rear Shock: Fox Float RP2, 140mm-travel Brakes: Avid Elixir hydraulic disc Shift Levers: Shimano SLX Rear Cogs: SRAM PG-970, 9-speed: 11-34 Saddle: Bontrager Rhythm Elite Handlebar: Bontrager Race Lite Factory Description Any terrain, any speed, any angle. Fisher's Roscoe 2 redefines all-mountain. With 140mm of Fox-supplied travel both front and rear, the Roscoe tackles tough trails, technical features and fast descents with ease. Add to that Shimano's SLX group and light Bontrager wheels and you get a machine that gets up to XC speed and makes epic rides your standard outing. And this trail ride is loaded with go-fast advances, like the E2 headtube for front-end stiffness, an Active Braking Pivot linkage that keeps your rear suspension fully active while braking and Fisher's G2 geometry for laser-like handling at any speed. Has some wear and tear but mostly in good shape. Never ridden too hard as it was my first mountain bike. Both shocks were just serviced and only have about 15 miles ridden since then. Will include new brake pads. See photos for details of condition. Thanks for looking.